I think it would be an understatement to say that the pre-show media blitz paid off. We filled the Shell up with families hailing from Midtown, downtown, Germantown, and even Nashville. In addition to rocking and romping, there was hoola hooping, splashing, juice box gorging, and lots of sweating! What we did not have was a drop of rain, which was just fine with me considering there had been threats of thunderstorms all day. Robby Grant started the show with his solo version of Vending Machine. His son, Five, came on as promised and helped him out with a few songs. This totally blew the kids away--well, at least my kids who already consider Five to be the bee's knees. Everyone was having a great time, except for maybe the people trapped in our mile long beer line! Don't worry, the most awesome Corey Crowder went in search of a second tap. And little Bailey here helped the sun-dazed adults pump the beer as fast as possible. The music barely started before the invasion of the Ice Cream Man. He had a line rivaling that of the Yeungling! Actually, by the end we had TWO Ice Cream Men profiting off of our large crowd. From what I hear, once was licensed to be in the park, and one was not. Yes, dueling Ice Cream Men! Next up. was Scandaliz Vandalistz. They were a HUGE hit with the audience, both young and old. Their shout out to fellow White Station students/alums elicited may whoops from the crowd. One young songwriter in particular told her mom that she was inspired to start writing about "real stuff" after seeing them play! The Vandalistz now hold the record for most CDs sold at a Rock-n-Romp. Our final act was the Kenny Brown Band. They got everyone dancing and grooving. All in all it was a near perfect show. Thanks so much for everyone who came out! And a special thanks to the Memphis Music Foundation, the Levitt Shell support staff, and the Rock-n-Romp board members who worked their asses off to make the show extra super awesome. See the rest of Chip's pictures here and please add your own to our Flickr Pool. Looks like we might get a few sprinkles, but Chip has consulted the radar and says the thunderstorms won't ruin the Rock-n-Romp. So come enjoy the show--rain or shine--at the Shell 4-7pm. Here's Robby Grant and his son, Five, on yesterday's Live at 9, promoting Saturday's Rock-n-Romp! Looking forward to seeing everyone this Saturday! Here's the band order for those of you planning strategic nap times! See you July 11th at the Shell! We'll have sprinklers, baby pools, tents, beer, and water to keep you cool! Bring a blanket/chair and a snack to share. Please remember to stop by the registration table and make your $5 donation! Adults must be accompanied by children. 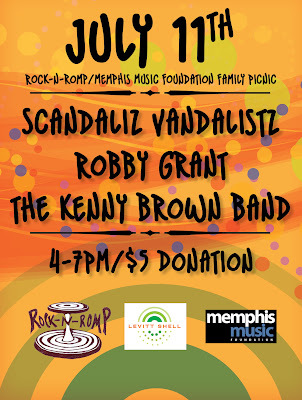 Thanks to the Memphis Music Foundation for partnering with us on this one! And thanks to the Shell for hosting!